The weekend is every bettors dream and between August and May, every weekend throws up some fantastic fixtures to win a few quid on. Whether you be looking to bet on the Premier League, the Bundesliga or La Liga, there are plenty of games to build an acca with and William Hill has one of the largest selections on the market. 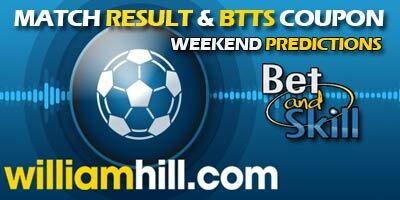 Every week we’ll bring you the best Match Result odds alongside BTTS offers and accumulators from 3-fold up to 6-fold. Sign up with promo code C30! Let's try to build some accumulators and see how much we can win! For those who are new to betting, or perhaps wish to explore other markets, here is the perfect place to start. William Hill’s markets are simple to understand and their great sign-up offers and price boosts will help you scoop a real jackpot. Take a browse below for everything you need to know about the betting tips on this page and improve your chances of winning today! What is Match Result Betting? Match Result betting is perhaps the most common form of betting and is essentially you placing a bet on the outcome of the match. William Hill offer this across a variety of sports, with a football betting market that covers almost every league imaginable. So, whether you’re looking to back Liverpool to beat Manchester City, or Toulouse to beat Metz, William Hill have you covered. What you’re betting on will be a certain team to win or draw. Of course, in sports such as tennis or golf, it may also be an individual you are backing to win. It really is that simple. Our football predictions and match result bets above diversify across a number of leagues and will often combine BTTS into them to boost the odds. BTTS is an abbreviation for ‘both teams to score’ and is a wager that means you’re backing both teams to score in a fixture. So, for example, if you wanted to bet on a fixture between Liverpool and Manchester City, a BTTS bet would require both Liverpool and City to score for the bet to pay out. BTTS bets are a good way of boosting the odds of a match result bet and are becoming more and more popular. Above you’ll find all our best Match Result and BTTS tips, which are updated each and every week, bringing you the very best William Hill odds. How Does Match Result and BTTS Work? Match Result and BTTS bets are also commonly known as BTTS and Win wagers and is two wagers rolled into one. This is done to boost the odds. For example, in a game between Manchester United and West Brom, the odds for the home side to win would offer a relatively low pay out. However, by adding both teams to score, it would lower the likelihood of it happening and boost your odds. That’s because you need two bets to come through to win. The first being Manchester United to win in the first place, and the second being both Manchester United and West Brom to score. What this means is you can’t win with a result that is a to nil outcome. 1-0, 2-0, 3-0, 4-0 and so forth. Additionally, you’d also lose the bet if Manchester United drew or lost, of course. Why Play Match Result and BTTS? The main reason for playing a Match Result and BTTS bet is simple, you’ll get better odds. And better odds equals a bigger payout. Of course, it is a harder bet to win, but we use some of the best tipsters and experts on the market to help with our William Hill BTTS and Win tips. For the most part, Match Result and both teams to score bets are placed on the bigger teams such as your Manchester City, Chelsea, Liverpool etc. This is because there’s already a high chance of them winning the game and the first part of your bet coming through. You’ll see a noticeable difference in the odds in a simple Match Result bet compared to Match Result and BTTS. This would give you a nice payout should United win and West Brom grab a goal. But of course, this outcome is less favoured with the bookies. An accumulator is a bet that combines a number of outcomes into one bet. Above you’ll find a number of accumulator tips with various folds. The number of folds signifies the number of outcomes or lines you’re betting on. So a 3-fold accumulator would be a bet made up of three different outcomes, while a 6-fold would involve six. Accumulators are commonly used on both horse racing betting and football, with our favourite tips for the latter shown above. As you can see, our 6-fold accumulators show our top six picks for a weekend. An accumulator can include a number of outcomes, with us most regularly including our match result or match result and BTTS tips within our accas. To win, all outcomes within the accumulator must come through. In the unlikely case of a match being postponed or abandoned, the bet will generally be null and void and your stake money will be returned. Similar to a match result and BTTS bet, an accumulator will boost the odds of your bet as there is more chance of that bet not coming through. Many will combine the top teams into an accumulator to boost their odds, so rather than backing Manchester City, Liverpool and Tottenham separately, you’d increase your payout by placing them in an accumulator, the only downside being if one side doesn’t win, your bet loses. As you’d expect, the more teams in your accumulator, the higher the risk and the higher the reward. Our accumulator tips are chosen by the very best out there and are combined with fantastic William Hill odds. We study all the form so you don’t have to and build accumulators with teams and leagues right across Europe. Why not check out some of our best no deposit free bets or betting offers and combine them with an accumulator bet and get your journey started today?! "This Weekend’s Match Result, BTTS Tips & Accumulators with William Hill"